Inspired by the metallic looks at this year’s Oscars and the release this month of a very glittery movie rendition of The Great Gatsby Adrienne of The Rich Life (on a budget) and I thought that for May’s “How I Wear My” post it was a great time to unleash our inner magpies! I always love the unexpected flash of metallics in an outfit, whether I’m wearing it or observing it! I never get tired of metallics and there are some lovely ones featured here in gold, silver, bronze, and pewter. Adrienne, above, of The Rich Life (on a budget), is wearing a dynamite bronze jacket she found at Goodwill! I love how she styled it, don’t you? Bella of The Citizen Rosebud. Bella of The Citizen Rosebud wears a gold metallic bag that pairs so well with her navy and cream stripes and dots! Sheree of It’s Not That Deep works silver metallics into her gorgeous lavender look—with belt, shoes and bag. Sarah of Cloud of Secrets. I love warm pewter or soft bronze for accessories, because I can wear them with gold or silver, or warm or cool tones, or everything and both. I think the clutch is working here with warm gold tapestry and cool grey jeans. Becky of Pink Cheetah Vintage. Becky of Pink Cheetah Vintage is wearing a gorgeous dress of her mother’s from the 1970s, her all-time favorite, with the perfect gold belt. I’m not terribly adventurous with metallics but these flats get a lot of wear with everything—jeans, trousers, dresses, skirts. They are from Clarks Girls (I have tiny feet), the leather is so soft and the colour is a soft gold. Suzanne of Suzanne Carillo Style Files loves these silver sandals because they go with everything. I love the sandals AND that owl bag! Heather of Vintage French Chic. 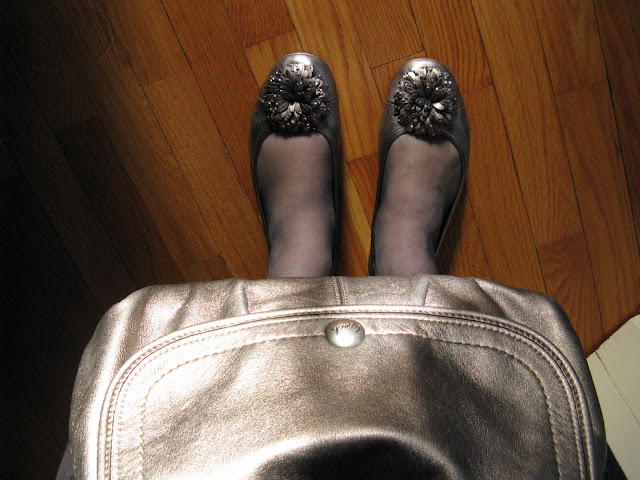 I love wearing metallic accessories, especially shoes. Even my summer sandals are metallic. I just feel they can be more versatile and go with more things. I love the color of Heather’s bag and shoes! With Tippi the cat in the background, on the hunt for something. I don’t want to know! I usually incorporate metallics into an outfit with accessories, typically shoes (though after seeing these lovely ladies with their metallic bags, I wish I had one too!). So when I found these Bandolino shoes I went a little nutty and bought them in two different metallic tones—silver and bronze (I also bought them in black patent). They are so comfortable! I wear them all spring and summer long. These Bandolino shoes are faux-lizard stamped, which I love. The silver crushed glitter belt is from J. Crew and the mint green sleeveless knit tank woven with silver metallic thread is by Bisou Bisou. Tiny silver threads are woven into this mint green Bisou Bisou top. What a shiny and fun way to welcome May! For June, the month of roses, don’t you just want to cover yourself with glorious flowers? If so, please join us for “How I Wear My: Florals.” Send a picture to Adrienne or me by June 3. Do head over to Adrienne’s to see the other metallic looks on even more ladies. And thanks to the fine foxes who participated this month! Jill, that mint green top with the silver is beautiful! Everyone looks amazing in this challenge on both blogs...really enjoyed the posts!! Will think of you at your event today...have fun!! Thank you for the inclusion, Jill! I still love your metallic Bandolino ballerinas-with-a-bit-of-heel, and I always have half an eye open for some, myself. Jill! I love the glitter belt and those shoes- I too would want them in many colors! Those silver Bandolino shoes look amazing. Everyone looks great. It goes to show that a little bit of metallic can go a long ways. Your flats just reminded me of my silver flats that I've not worn in a while....gotta dig'm out. This is really fun! Glad to see so many fashionable ladies participating. Who knew metallics were so versatile?? These sparkling outfits are so fun. I love seeing how each one has a different twist. Love your bisou bisou sparkle sweater-lovely shade. Thank you so much for including me! I'm totally inspired by everyone now :-) Jill, I love your whole look and your shoes, of course! What a great group of stylish women! I love all the accessories from shoes to bags to belts. Looking forward to floral next month...and now I think I need to go look for some silver or bronze shoes. They look so versatile and chic!